Home Travel Pobitora Wildlife Sanctuary: A Heavenly Abode for Birders! Pobitora Wildlife Sanctuary is one of the most famous wildlife destinations in Northeast India. It is well-known all over for its flora and fauna as well as for being the home of many migratory birds. Located at a distance of around 60 km from Guwahati, the Pobitora Wildlife Sanctuary is mostly known for its large population of the one-horned rhinoceros. However, to say that that is the only thing the place is worth visiting for would be unjust. For people who are interested in birding or bird watching, Pobitora Wildlife Sanctuary is indeed a heavenly abode. There are over 375 species of birds found here. Birders from all over the world visit this place and are often left spellbound with the mesmerizing beauty of the birds. So, let us know more about some of those birds found in the Pobitora Wildlife Sanctuary! The common kingfisher is a colourful bird that belongs to the family of Alcedinidae. Its binomial name is Alcedo atthis. It is one of the brightest looking birds you will see out there, with its wings being bluish green and the rest of the upper parts being vivid blue. In contrast, its underbody is orange in colour. 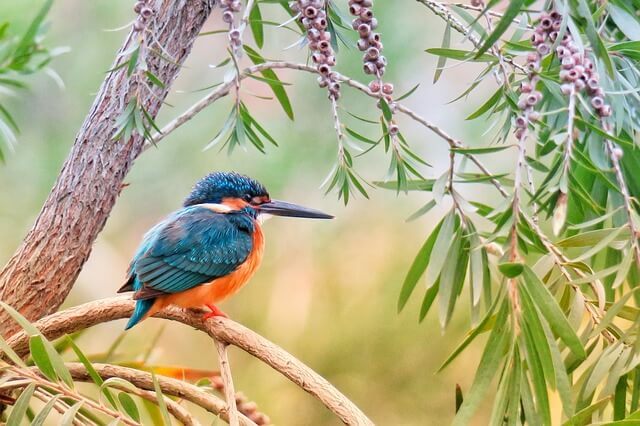 Being so brightly coloured, the common kingfisher is one of the most beautiful birds to look at. They are generally 17-19 cm long and have a weight of around 34-46 gms. They are found in places with or near flowing water such as rivers and lakes. They also eat insects found in water. The common kingfishers are known for their sharp eyesight. The blue-winged leafbird comes from the family of Chloropseidae. Its binomial name is Chloropsis cochinchinensis. Some of their other names are blue-winged chloropsis and golden-mantled leafbird. They are generally 5.5 to 8.3 inches long and weigh around 0.53 to 1.60 oz. They get their name ‘blue-winged leafbird’ because of having blue wings, while almost the rest of their body is green in colour. The males have a more yellowish head, while that of the females is greener. The males also have a black face and throat while the females have a blue throat. They are found in humid and evergreen forests. One of the notable qualities of these birds is that they can pick up the sounds of other birds. The northern shoveler is a bird species from the family of Anatidae. Its binomial name is Spatula clypeata. It is known as just shoveler in Britain. It gets this name because of having a shovel-shaped bill. The northern shovelers are around 44-51 cm long and weigh about 400-820 g. The males are very colourful with their neck and head being green, and the rest of the body being a combination of white, blue and rust. The females are mostly brown in colour, with an orange bill. They are found in wet grasslands and coastal marshes. They mostly feed on aquatic invertebrates. The common iora is a bird that belongs to the family of Aeigithinidae. Its binomial name is Aeigithina tiphia. These birds are extremely bright and easily recognisable because of that. There is a difference in the look of adult breeding males and non-breeding males. The adult breeding males have dark green, almost black upperparts, the underbody being bright yellow. The non-breeding males have green upperparts, and the underbody is dull yellow in colour. The non-breeding males and females look quite similar. They are found in forests and they mostly feed on insects. The male birds are known to do dazzling acrobatic displays in the air to attract the female birds during the breeding season. The little egret comes from the family of Ardeidae. Its binomial name is Egretta garzetta. It is a small heron with a white body, long black bill and black legs. The length of an adult egret is around 55-65 cm and its weight is 350-550 g. They are found in wetlands and they mostly feed on aquatic creatures. Their eggs are bluish green in colour and both the parents take turns to incubate them. Their breeding season is generally between March and June. The barn swallow is a bird that belongs to the family of Hirundinidae. Its binomial name is Hirundo rustica. These birds are around 17-19 cm long and their weight is approximately 16-22 g. Their upperparts are blue, with the forehead, throat and chin being rufous coloured and the underbody is off white. They are mostly found in open countries with not so much vegetation around. They feed on flies and other insects. They prefer to build their nests in stables and barns. Their breeding season is at its peak between February to September and in some cases, till October. Their nest is defended by both males and females. The Eurasian collared dove belongs to the family of Columbidae. Its binomial name is Streptopelia decaocto. They are medium-sized birds, neither too big nor too small and are greyish in colour. They are around 32 cm long and their weight is 125-240 g. Males and females are similar in looks. They lay around two eggs at the same time and then the male and the female birds take turns with incubating the eggs. As far as their diet is concerned, they feed on berries, seeds and some insects.